All About Barrhead has been given �1,500. East Renfrewshire Council has secured a range of community benefits as part of the contract for their first house build project in a generation. Eight new jobs and 13 work experience placements will be created as part of the agreement with contractor CCG (Scotland) Ltd, during the building of 43 new council homes at Robertson Street, Fenwick Drive and Blackbyres Court, Barrhead. The work at project part of the council’s commitment to deliver 240 homes for social rent over the next five years. Work has already started at the Robertson Street site and it is due to be complete by the end of this year. 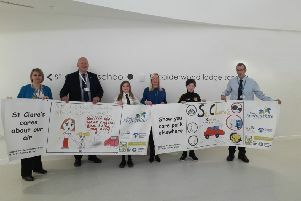 Throughout the building works, a range of learning opportunities for East Renfrewshire schools will be developed by the company, giving young people the opportunity to learn about careers in different areas of the construction business, including project management. Barrhead’s Business Improvement District (BID) will also benefit from the partnership with CCG (Scotland) Ltd.
A new intern is to be appointed to work on town centre initiatives in Barrhead, with part of the salary being sponsored by the firm. There will also be future donations of up to £9,500 to other Barrhead community and employability causes throughout the project. Councillor Danny Devlin, convener of housing and maintenance, said: “The Council house build project is exciting for the people of Barrhead and we are delighted to be developing more homes for social rent, which will benefit residents for generations to come. Paul Santi, chairman of Barrhead Business Improvement District, said: “This contribution to the BID district is gratefully received.